Universal app for iPad and iPhone. Up to 10 players on iPad (paid version only). Works with Apple’s Game Center. 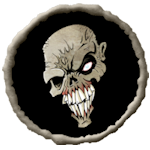 Earn 16 different disgusting Achievements, and compete with your friends on the Leaderboards for most brains eaten. Lots and lots of new zombie names!